Current New Charm, bright spaces, ALL without car, quiet area. 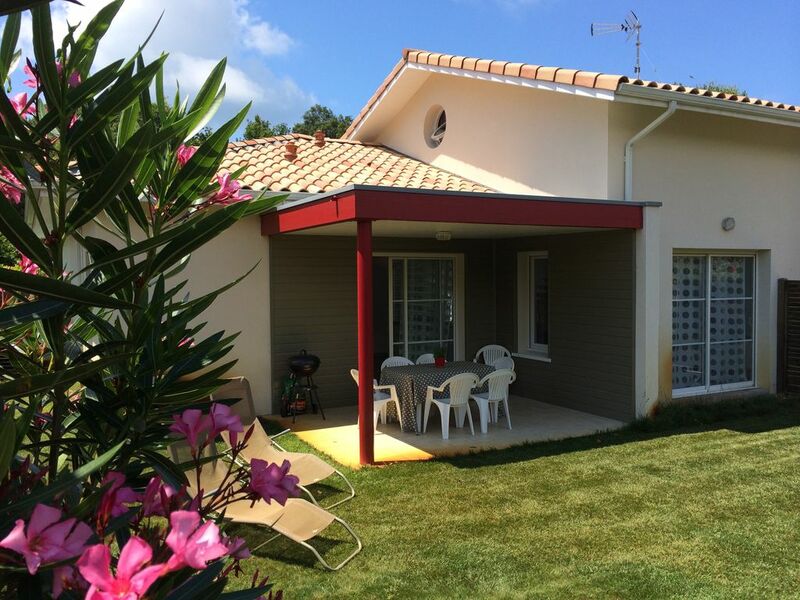 90 m2 for 6 people: you are 400 m from the beach of the marine lake and the shopping center, direct access to the bike path, 800m from the sea, 600 m from golf and tennis. Private parking. Very quiet area, new construction with terrace of 12 m2 and private garden of 240 m2. The garden is decorated with flowers and essences typical of the Landes with a green lawn! with integrated watering. You are close to many activities. Very bright semi-detached house that can be rented with an identical second (contact us) the kitchen is American with central island on living room of 32 m2 with 2 windows overlooking terrace and garden, 3 bedrooms with wardrobes, 1 bathroom with bath and cabin shower, separate toilet. All rooms are very bright and have windows even the bathroom .. The decor is very modern, lots of white, driftwood found on the surrounding beaches, pebble friezes in the bathroom, everything for a real holiday! We had a real crush on the location of the land where an old house was located that we could not rehabilitate. It was then easy to build what we wanted. The property is close to ALL, the sea, the marine lake, the village center (for shopping and restaurants), activities, the beautiful bike path 2 steps. It is a true anti-stress. The district is one of the first built on VIEUX-BOUCAU, it is residential and quiet, far from typical noisy tourist sites. The property is not on the edge of a national road or a busy road so you can leave peacefully your rental without stress, especially if you have children. We wanted to give the interior of the house a sense of space and brightness with large windows. You have on these electric curtains with switches all grouped on a wall at the entrance or exit of the house, it is very convenient. The decor is refined and soothing with the comfort we would like to have when we rent too. We will always listen to your comments. Outside the flower garden has a built-in watering which gives a nice green lawn and a feeling of well being. You just have to make the most of your holidays! 1 bathroom with large window, well lit, with bath and shower, a towel warmer, a piece of furniture 2 basins with mirror and spotlights. We wanted to give you a holiday mood with a frieze shingle. The bathroom is functional and practical as for large than for small pieces! You have a window that you can open on the garden, natural light enters the room, it is only better! All equipment of the house is new. For small appliances you have: 1 toaster, 1 electric kettle, 1 coffee maker, 1 juicer, 1 electric mixer, 1 microwave, 1 oven, 1 hair dryer. Television is a flat screen Sony new high quality. You have 1 high chair and a cot for the little ones! Nous avons passés 3 semaines à 4 en famille dans cette maison. La maison est conforme à l’annonce. Elle est très bien positionnée dans Vieux-Boucau, très claire avec de grandes baies vitrées, décorée avec gout, et très bien équipée. Les propriétaires sont très accueillants et bienveillants. Je ne peux que recommander. Sehr schönes Haus, tolle Lage! Wir haben mit unserem Sohn (6 Jahre) 2 tolle Ferienwochen in Vieux Boucau verbracht. Das Haus ist sehr schön und geräumig. Es ist gut ausgestattet und - wie die Bilder auch zeigen - hell und freundlich eingerichtet. Alles ist sauber und in einem sehr guten Zustand. In allen Zimmern gibt es elektrische Jalousien. Es ist wohnlich dekoriert ohne dabei überladen zu sein. Der Garten ist groß und auch wenn die andere Haushälfte belegt ist, merkt man davon nichts. Die Lage ist perfekt. Total ruhig und dennoch ist man mit dem Fahrrad in 3 Minuten am See und in 5 Minuten in Vieux Boucau. Direkt hinter dem Haus führt der Radweg durch die Pinienwälder nach Messanges und Soustons. Die Vermieterin ist sehr nett und hilfsbereit. Alle Fragen im Vorfeld sind per Mail schnell und freundlich beantwortet worden. Auch während des Urlaubs hat sie gemailt und nachgefragt, ob alles passt. Wir haben uns sehr wohlgefühlt und können das Haus nur empfehlen. Thank you so much Steffen! The home situation is exceptional because you don’t need your car. We enjoy a lot meeting travelers like you! Hemos estado 4 días en la casa y la verdad es que no tenemos nada para quejarnos. Lo tiene todo para disfrutar de la escapada rutinaria, y con buen tiempo, aprovechas su jardin trasero y la barbacoa. Muy recomendable! Nous avons été chaleureusement accueillis par la propriétaire. La location correspond en tous points à la description qui est faite sur le site internet. La maison est spacieuse, décorée avec soin et dispose de tout ce dont on peut avoir besoin pour passer d'agréables moments. Elle est située dans un quartier très calme et à proximité du lac, de la mer et des commerces. Il est possible de laisser sa voiture en arrivant et de n'utiliser que ses jambes ou son vélo pendant tout le séjour. Nous avons été ravi de nos vacances et ne pouvons que recommander cette location à qui veut passer de bonne vacances en famille ou entre amis dans cette belle région des Landes. Wir haben mit unseren Kindern (8 und 11 Jahre) zehn wunderbare Tage in Vieux Boucau verbracht. Das Haus ist nur zu empfehlen: moderne Ausstattung, sehr sauber, hell und großzügig. Als angenehm haben wir die zwei Etagen empfunden. Trotz Doppelhaus (und besetzter anderer Hälfte), haben wir von unseren Nachbarn so gut wie nichts mitbekommen – Garten und Terrasse sind sehr geschickt angeordnet und erlauben maximale Ruhe. Lage des Hauses ist perfekt und ruhig. Die Vermieterin, Madame Cambra, ist sehr zuvorkommend, freundlich und hilfsbereit. Sehr entspannter Kontakt im Vorfeld und während unseres Aufenthaltes. La réponse de ma part sera originale car je ne parle pas allemand et je n'ai pas compris l'appréciation ! Compte tenu de la note de 5 étoiles, je pense que cette très gentille famille a apprécié le lieu, sa situation, car on peut TOUT faire à pied ! La voiture peut rester dans le parking. Vieux-Boucau vous attend, c'est un village authentique et sympathique ! You will not need to use your car for your holiday, everything is nearby: the village center with its shops, restaurants, arenas where you can enjoy racing Landes bulls, they are very entertaining for both large for small. You will also Pinsolle Golf, tennis, cinema, walks in the woods on foot or by bike with a beautiful bike path. Outings are organized by the rangers who learn to know our natural heritage forest and the dunes, they will tell you how to preserve them. You do not oublirez the department 40! PROMOTION A PARTIR DE 2 SEMAINES DE LOCATION DU 24/04/2017 AU 1/06/2017: NOUS CONSULTER. - A la réservation du bien, nous vous remercions de bien vouloir nous envoyer les arrhes soient les 25% du loyer arrondi à la dizaine supérieure PAR VIREMENT BANCAIRE et le contrat complété, signé et paraphé (vos initiales) sur chaque page, une attestation d'assurances Responsabilité Civile. Nous vous renverrons par retour un exemplaire signé et paraphé par nous mêmes. - 1 mois avant l'entrée dans les lieux, nous demandons le solde de la location. - A l'entrée dans les lieux , nous vous demanderons une caution de 500€ par chèque ou par espèces, elle vous sera retournée dans un délai de 10 jours maximum. Si vous souhaitez réserver à la dernière minute, vous pouvez nous contacter par téléphone, merci beaucoup . IMPORTANT: -Le linge de maison ( draps, serviettes tapis de bain, torchons) n'est pas inclus dans la location, nous pouvons vous proposer ce service pour 18€/personne, -Le ménage de fin de location si vous souhaitez le demander sera fait pour 60€. N'oubliez pas de nous confirmer ces options. A très vite!